This group might boggle the mind even more than the Kapoors—to whom, thanks to Kishore Kumar's countless marriages, they are also connected. In college, I had a giant chart of the English royal family since the early medieval period (history major WHAT WHAT), and this one is no less complex. I don't have the words to express how amazed I am by all of this, the layer upon layer of connections, even though there is nothing new in families staying in the same business across generations or in allying with others in the same field. Horrifying corollary: if Rani Mukherjee marries Aditya Chopra, then Uday Chopra and Satyajit Ray will be distantly related. Only by marriage, but still. 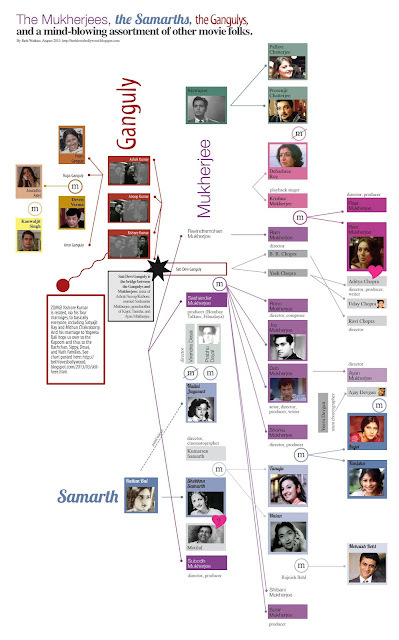 Previous family tree projects: the Irani sisters (including Javed Akhtar, Shabana Azmi, and Farah Khan), the Feroz and Sanjay Khans and Roshans (with Mumtaz! 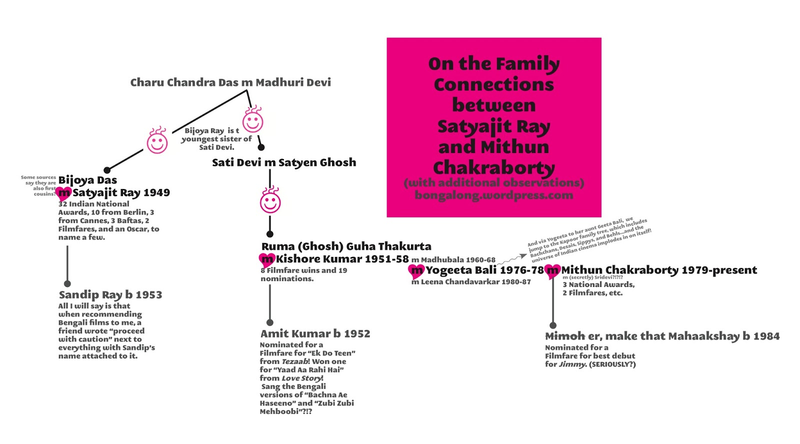 ), Satyajit Ray to Mithun Chakraborty (which shows the link to the Kapoors), and the Kapoors (which I need to re-do in a more visually clear and image-heavy form). Oh. My. Gosh. This is, indeed, mind-blowing. I don't have words, except that I will say that I didn't realize Kishore Kumar had warbled his way into so many filmi-family trees. It certainly does beg a comparison to the genealogy of the royal families of Europe. (1) Actress/singer Ratanbai was not related to Shobhna Samarth. Her mother was also named Ratanbai but wasnt in the movie industry. (2) Karan Johar's mother Hiroo Johar is sister of Yash and B R Chopra, so that links Johars also with Chopra. Bluefire - I have read that about Kjo and the Chopras in two places but then read it is NOT true in many more. I actually have a version of the tree that includes them and will put that up instead if I can find out definitively. If you can point me to a good source, I'd be grateful.